And even though they had their ups and downs as a family, Simon’s life was, by all accounts, OK. You could even say he was happy with the life he’d built for himself. However, Simon had this vague, nagging feeling inside of him that he couldn’t quite put his finger on. It had always been there even before he started his job and got married. It was a faint whisper that Simon ignored because he was busy raising his family and climbing the corporate ladder. But Simon got older, he found it harder and harder to brush it off. Now that Simon was almost in his fifties, he finally acknowledged that voice inside of him. As a kid, Simon loved being in the kitchen because of his grandmother who had a passion for cooking. Simon had always looked up to his Granna (as he liked to call her), which was why he inherited her love for making homemade treats. Simon had a bit of a sweet tooth, so he loved making all sorts of desserts – which of course, his Granna taught him how to do. At the same time, Simon got busy baking and started selling his goods to his friends and neighbors. Thanks to social media, word quickly got around and soon he got his old buddies to help him keep up with the increasing demand for his sweet treats. But it’s actually it’s a way of life that puts you on the path to greatness. You’ve heard of affirmations and you’ve probably tried them before. But chances are you could do it better – especially if you’ve been experiencing limited results. So the first priority is to change your core beliefs by rewiring your everyday thought patterns. To do that, you need to create brief but powerful affirmations that will define the reality you choose to live in. • Do some inner reflection about what you want in life. For example, you might dream about putting up an after school center for kids in grade school. At the same time, you also want to set up a parenting blog to help moms and dads take better care of their children. Then ask yourself: what do these things have in common? What similar values do your goals represent? • The next step is to dissect your desires and take a closer look. Putting up that center and your blog could be tied to your passion for caring about children. How have your past experiences influenced your passion? More importantly, what fears and doubts are getting in the way of manifesting your desires into reality? • To get the most power out of your affirmation, it to be stated as a FACT, and not as wishful thinking. You need to say it as if it’s happening right now. Remember – the belief comes first, then the reality. If you want to sharpen your mind and use it to achieve your dreams, this is one habit worth investing in. »»»»»»»»»»»»»»»»»»»»»»»»»»»»»» Download this Law Of Attraction book as PDF. Try to think of this as a process of discovering who you really are. This is basically the whole reason you’re making this breakthrough in your life right now. …or by doing nothing about it. Either way, your current situation is clear proof of that. That “small” change in direction you make today – and the other ones after that – will radically change the course of your life. »»»»»»»»»»» Download this Dream Life Manifestation: 7 Secrets To Creating Your Best Life Possible PDF, here. You see, attracting the life you want begins through change, but most folks don’t think they have the power to do this. This is extremely empowering for a couple of reasons. I’ve found that doing this raises your frequency high enough for the universe to hear – and transforms you into an abundance magnet. Here’s another great thing about going about your day with positive energy: it creates a natural buffer that “insulates” you. When you cultivate an energy that feeds on gratitude, you’re helping the Universe give you more of what you choose to FOCUS on. It might be an ex-partner who told them they’re not attractive enough……a classmate who made fun of them all the time……or a parent who dismissed their dreams because “it wasn’t the best fit” for them. People unconsciously feed into this negative energy which keeps that stoplight forever red. This is the baggage you need to get rid of. Dig deep and come to terms with the events and encounters that might be messing with your own spiritual stoplight. And once you’ve cut off this source of negative energy, you’ll give yourself the green light and head full speed towards your dream life! Listen, I know it’s like to struggle against yourself. Worse, I felt like fraud from living as a happy and fulfilled version of myself……when in fact, I was actually falling apart on the inside. I finally rediscovered my life’s purpose – and on top of that, I attracted a better life effortlessly without feeling like a phony. Better still, I didn’t have to be a mindless zombie from working all the time. As much as I’d like to give you the full story of how I did it, I’d rather that you watch my free video, instead. 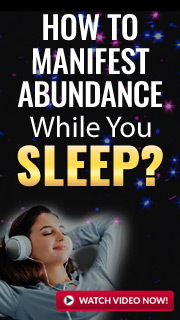 To learn the secret on how I did this, click here NOW…..Enjoy!